This past Thursday my daughter and I, along with her nanny, met with three members of the Commonwealth of Massachussets’ House of Representatives. 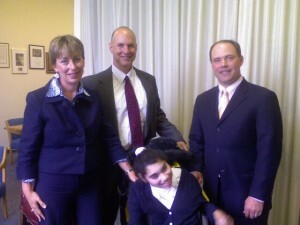 In the order of the picture, Representative Barbara L’Italien, Representative Tom Sannicandro, Representative and Majority Leader John Rogers. It was a great meeting and they are interested in helping. I will update with more information shortly. No one has stepped up to the plate. Basically, they are all “following the law.” This is so ridiculous … ok, so now we change the law. The Commissioner of Education has responded to my request to have my daughter excused from the MCAS. Basically he says he cannot do it. He also responds to one of my points but not the others. No one has yet to explain why my daughter needs to have a concept of history (defined as events previous to 1990) and to be tested in any way within the context of that subject. Just one example of testing her to the Curriculum Frameworks. It is interesting that the Commissioner references the IDEA laws but not the NCLB. As my staff has shared with you, state and federal laws, such as the Individuals with Disabilities Education Act (IDEA), require that all students be provided access to and the opportunity to make progress in the general curriculum. In addition, you may be aware that the Department has created a guide to the Massachusetts learning standards specifically for students with significant cognitive disabilities. This guide outlines tasks and activities at varying levels of complexity in each content area, and includes skills appropriate for students with even the most severe disabilities. This statement shows that the Commissioner unfortunately does not have a grasp of the category of “severely disabled.” The idea of my daughter making “progress in the general curriculum” is absurd and MCAS-Alt testing for her does not and cannot show that she is “provided access to and the opportunity to make progress in the general curriculum.” The guide he refers to for students with “significant cognitive disabilities” does not include anything that is relevant to my daughter as far as I can find. It is obvious that the concept of a child who has absolutely no communicative abilities, no ability to perform any task requested of her is one that did not play a part in any of the design or planning of this assessment. I would do anything possible to have the Commissioner and his staff spend just 30 minutes with my daughter. If anyone knows how to arrange this, please let me know! Nancy Hanson of the DOE has told my daughter’s teacher that if she raises her head for five seconds while she is being spoken to in English, that counts for part of the English requirement. What on earth counts as part of the History requirement is unknown to me, but it has been made clear to my daughter’s teacher that it MUST be in the context of history. Maybe if she drools while being told of the nuances of the Emancipation Proclamation she will pass. The Department of Education is apparently bound by the laws of the Commonwealth and the NCLB as well as their own lack of understanding of this particular population. We must work to modify the laws and regulations concerning the MCAS, especially and specifically how it deals with the severely disabled student. The idea is for accountability and assessment, as far as I understand. That will NOT be accomplished by testing my daughter in Math, English, History and Science. There are other ways. Accountability and assessment are vital, I agree and support that. But not at the expense of these students. Not testing and grading her in absurd ways. I have run out of options through the educational channels and now turn to our law makers. The Honorable John Rogers, State Representative and Majority Leader has agreed to meet with me to discuss these issues and I greatly appreciate his time and look forward to our meeting. Please write to me with any ideas and information. I just received this letter from the Commissioner. He tells me that the law does not allow him to exempt my daughter and he responds to the issue of self-evaluation. It is interesting he does not respond to other issues, just those where I am in error. I have removed my daughter’s name, otherwise his letter, as received. I am writing in response to your recent communications with the Department regarding your daughter. Thank you for talking with me yesterday. I know that you have expressed a number of concerns, and I understand, based on the many documented exchanges with the Department, that they center around two issues. First, you have requested that your daughter not be assessed by the Massachusetts Comprehensive Assessment System (MCAS). Second, you have questioned whether it is appropriate to require severely disabled students, such as your daughter, to receive instruction based on the standards in the curriculum frameworks. With respect to the first issue you raise, I understand that you would like your daughter not to be assessed on the MCAS. As members of my staff have informed you, and as I indicated in a statement issued to the press in June, all students educated with public funds, without exception, must be assessed by MCAS in accordance with state and federal law. As we have shared with you, if a student has a disability, the student’s IEP Team determines whether it is most appropriate for the student to participate in the standard MCAS test (with or without accommodations) or in the MCAS-Alt, an alternate assessment process for students with disabilities, particularly students with severe cognitive disabilities. The MCAS-Alt is based on a body of student work (portfolio) collected by the student’s teacher throughout the course of the school year. It may be helpful to understand the purpose of the laws requiring the assessment of all students, including students with severe cognitive disabilities. The legal requirements underscore the importance and intrinsic value of educating all students, irrespective of disability. The law also ensures that schools are accountable for providing all students access to the academic curriculum. In keeping with these laws, MCAS testing is intended to ensure that all students are provided access to the general curriculum and have the opportunity to improve their skills in the content areas. MCAS results allow administrators, educators, and parents to see what students have learned and to set goals for students. Nearly 8000 students statewide, most of whom have significant cognitive disabilities, participate annually in the MCAS-Alt; among these are students with severe communications disorders. In your letter and in our telephone conversation, you referred to Massachusetts regulation 603 CMR 30.03(3)(b) as the basis for requesting a waiver of the MCAS requirement for your daughter. This regulation has been cited out of context. The regulation refers to the legal authority of the commissioner to allow a student in the class of 2010 to be assessed in a high school science content area later than grade 10 in cases where a student transfers to a Massachusetts public school district after grade 10 or cannot be tested in Grade 10 due to illness. I can confirm that I, as commissioner, have no authority under state or federal law to exempt a student who is educated with public funds from being assessed on MCAS. With regard to the second issue you raise, I understand that you believe that, due to the nature and severity of your daughter’s disability, it is inappropriate for your daughter to receive instruction based on the standards contained in the curriculum frameworks. As my staff has shared with you, state and federal laws, such as the Individuals with Disabilities Education Act (IDEA), require that all students be provided access to and the opportunity to make progress in the general curriculum. In addition, you may be aware that the Department has created a guide to the Massachusetts learning standards specifically for students with significant cognitive disabilities. This guide outlines tasks and activities at varying levels of complexity in each content area, and includes skills appropriate for students with even the most severe disabilities. Special educators have used this guide as the basis of instruction for their students, as well as for compiling their MCAS-Alt portfolios. In response to your concerns regarding the “self-evaluation” component of the MCAS-Alt, I want to reassure you that this component is optional, as outlined in the MCAS-Alt Educator ‘s Manual posted to www.doe.mass.edu/mcas/alt/edmanual.pdf. The Department has been in touch with Superintendent Bill Lupini about your concerns. I encourage you to work with the superintendent and his staff to determine the most appropriate and effective strategy for delivering academic instruction to [your daughter]. I recognize that you have been disappointed and frustrated by the information Department staff has provided to you. While I acknowledge your disappointment, I fully support the integrity and accuracy of the information provided to you by members of my staff, especially MCAS-Alt Coordinator Nancy Hanson, and stand behind the professionalism and time that Nancy and others have given in their interactions with you. I trust that you will work with Brookline school officials to construct a solution that is responsive to the requirements of the law and meets [your daughter]’s educational needs. I appreciate your understanding that, unless new substantive developments occur in this case, or current federal and state laws and regulations are amended as they relate to this case, I consider this matter closed. I offer you and [your daughter] my best wishes. I want to thank you for your time on the phone today. I believe the exchange of information between us was a good one and will bear fruit with regards to the MCAS and the severely disabled. We appear to agree fully on what the alternate assessment should be. At this point I would like to respond to a couple of points that came up and to put them in writing as a way of verifying that I heard what in fact you were saying and vice versa. The part of the law the I refer to in asking you to waive the exam for my daughter is 603 CMR 30.03(3)(b) and is found on your web site here: http://www.doe.mass.edu/lawsregs/603cmr30.html?section=03. I am not a lawyer, and actually I am a bit surprised that in fact you are given this option, but there it is. Please let me know your interpretation of it. Since you do not know my daughter, one must keep in mind that she not only has no known form of communication, she has no known movements that are done with intent. She cannot scratch where she itches, cannot point, look somewhere on request, etc. You stated several times that the test “should be tailored to the child” and that it is “not appropriate to ask the student to do something she cannot do.” Additionally, you mentioned that what my daughter “should be experiencing in terms of assessment should be very much tailored to her conditions.” I could not agree more with all of that. My issue is that the guidelines that the teachers must follow are completely void of those ideas. This all brings me to the 2008 Educator’s Manual for MCAS-Alt. All the quotes to follow are from that document. My issue is that that document makes firm statements, has requirements, and demands things that now appear to be in complete contrast with your view of the what the alternate assessment should be for my daughter and for my son. All the page references offered are to that document. The first quotes show that the assessment must assess to the Curriculum Frameworks. There is no apparent “wiggle room” here, so anything done with the test MUST be to the Curriculum Framework. Hence any observation of my daughter must be with regards to Math, English, and Science. How does my daughter do that? She cannot. As you stated to me, it is “not appropriate to ask the student to do something she cannot do.” So then that “must include” requirement is … what? To be ignored? Is “must include” just a suggestion? How do you show (it is mandated) that a student “attempted to learn a new skill” with a student who cannot control their motion, cannot communicate in any manner? This is required and is judged against the Curriculum Frameworks. How do you do this with my daughter? From the start, she cannot show any of that. How will any of this, that she cannot do anyway, ensure that she has been given access to the Curriculum Frameworks, as required by law? Again, my issues are with the implementation, the mandates, and the guidelines surrounding the MCAS-Alt, not the fact that an assessment should be done. I received a call from the secretary (?) for the Commissioner of Education for the Commonwealth. We will have a phone call next Wednesday morning. Hopefully some progress. On another note, there is a new web site, just starting, worth checking out (you will see why). Check it out here. First the less: no response from Nancy Hanson of the Mass. DOE. What a surprise. Now the more: I have spoken with a wonderful woman in the Florida Department of Education she is helping me research the basis of the Florida law that allows an IEP team to exempt a student from the FCAT (their NCLB testing). I will post as I know more. Stay tuned! Together we represent the media, my daughter’s school district, and my daughter’s family. I am writing to you concerning the misinformation that the Massachusetts Department of Education is disseminating regarding my daughter directly and the MCAS-Alt exam indirectly. At this point, it appears to be an informed and deliberate misrepresentation and I believe that as a result we are unwittingly passing on false information. Note that on at least three occasions I have asked Ms. Hanson to explain that statement and she has declined to do so. In order to make that statement knowingly, one must fully understand what “participation in MCAS-Alt” means and what my daughter does “every day at school.” Without full knowledge of both, her statement cannot be based on the reality of the situation. Believing that the employees at the DOE take their jobs seriously, I must go on the assumption that Ms. Hanson is fully aware of what is required for participation in the MCAS-Alt and that she is fully aware of what my daughter does every day at school. I cannot fathom that that statement would be made otherwise: to do so would be unacceptably irresponsible. Note that this same statement was made to Ms. de la Garza and thus repeated on the evening newscast, and made to Ms. McCann and disseminated within the school district. My information on the MCAS-Alt comes from two sources. First is the 2008 Educator’s Manual for MCAS-Alt available on the MA DOE web site. Second is my daughter’s teacher. Please note that not only has she been trained by the DOE to properly administer the MCAS-Alt, she has also been trained to evaluate the MCAS-Alt that other teachers submit to the DOE. Thus, she has more training then the average teacher in this area. Participation in the MCAS-Alt requires just that, “participation.” There are times the student is required to self evaluate. There are times the student will be asked questions. There are times where the student’s output is collected. This is all required and documented in the Educator’s Manual. The student must participate in some active form. What does my daughter do “every day at school?” Unless Ms. Hanson knows differently than the school personnel, my daughter does not self evaluate. My daughter does not communicate at all. My daughter does not answer questions, because my daughter does not communicate at all. My daughter’s only output is physiological and that is not appropriate for collection for the DOE nor MCAS-Alt. My daughter does not write, draw, nor paint. My daughter does not sign: once again, she does not communicate at all. To summarize, during her school day, my daughter is not asked questions since she cannot answer them, my daughter is not asked to produce independent output since she cannot do so, my daughter is not asked to self-evaluate since she cannot do so. Her participation in any activity is purely by her physical presence, not by any active, purposeful interaction. My daughter never communicates any comprehension at all of Math, English, nor Science, NOR CAN SHE. The two of you have met Hannah and I am sure agree with me, her teacher, her aide, her medical team, and her family and friends, that my daughter cannot communicate at all. She may very well, however, fully understand her surroundings and often gives indications that she does. The only way the following statement “I want to assure you that participation in MCAS-Alt will not require your daughter to do anything she does not do every day at school” is true is if the MCAS-Alt requires NOTHING of the student: no output, no answers, no attention, no academic interaction. My point is that the statement made to the media, the school district, and the family that my daughter’s taking the MCAS-Alt will “not require [my daughter] to do anything she does not do every day at school” is misleading, inaccurate, and, as shown by my repeated request for clarification, evidently indefensible. Note again, I have on at least three occasions asked Ms. Hanson to explain the statement and she has continually avoided doing so. Please help me stop this misinformation campaign by not repeating these untrue statements originating in the office of the MCAS-Alt coordinator. Please note that you are totally avoiding my question once more and changing the subject. I will go along with that for the moment. My daughter HAS been provided access to the general curriculum all along. She has not been taught to it since she cannot communicate at all. Why would you attempt to teach my daughter square roots when she cannot prove she has a concept of the number “one”? My daughter has never “passed” nor shown she has mastered that which is taught in kindergarten. She cannot speak, write, draw, point, etc. She drools rather well. The idea of communication, augmented and not, has been on EVERY IEP my daughter has ever had. The goal of her educators, care givers, family, and medical community has always been communication. She has been evaluated repeatedly and every day communication, augmented and not, is attempted, taught and stressed. It is not a matter of not trying to get her to communicate, that is something I work (and pray) for daily with my daughter. What you seem to fail to grasp is that this is beyond our ability. My daughter DOES NOT communicate. THAT IS WHY she does not have a system of augmentative communication in place, because NO ONE has been able to figure one out. Not school, not Children’s Hospital, not her family, her other doctors, other educators. Why do you blame the IEP? My daughter’s IEP has ALWAYS contained communication issues and those curriculum issues that are appropriate. This is not an issue with the IEP nor the IEP team. This is an issue with the MCAS-Alt and I would appreciate your understanding that. Her IEP meets and exceeds all the requirements of the DOE, ADA, and any other acronyms you want to add. I am asking about YOUR testing here, not the school districts oversight of her education, which, by the way, is wonderful. All I ask is that you explain that. Your statement. Please, Nancy, understand that the IEP team, and the school district are doing a great job for my daughter and everything that is required of them. It is simply the fact that MY DAUGHTER CANNOT COMMUNICATE AT ALL and that is not for lack of trying or expertise, it is due to an act of God. Plain and simple. She cannot answer or signal an answer to anything. She cannot “produce” anything. All she “does” at school is look around, randomly touch things, smile, laugh, and drool. That is not to say that the school is not attempting to teach, that is not to say that she is not learning, it is only to say that she is not communicating that she is learning. Understand the difference. Can the IEP team specify that for the MCAS-Alt: “No data points nor data charts will be required and nothing produced by the student will be required and the student will not be required to respond at all to questions or situations presented.” ?? Thanks for your time and concern. Clue, clue, who has a clue? Thank you for your e-mail. I did receive your message. After reviewing your e-mail below, I do not have a great deal to add. I believe most of your concerns have already been addressed in my e-mail dated May 22, 2008. However, I am concerned you state your daughter had not received any program of instruction in the general curriculum and that she currently does not have a communication system in place. The presumption in state and federal law is that all students with disabilities will be instructed in the state’s academic learning standards. I encourage you to discuss these matters with the principal of your daughter’s school and her IEP Team. In case you have not already seen his statement, I am attaching the statement issued by the Commissioner of Elementary and Secondary Education on June 4, 2008. I wish you and [your daughter] all the best. I am baffled as to why you do not answer my question. Why does your office, and you, insist that my daughter will not need to do anything different than her normal school day when in fact you insist on 45 data points testing Math, English and Science over a period of up to two months and then asking her to self evaluate? Now you state that you are concerned that she does not have a communication system in place. Despite intervention from the medical, educational, and social communities, no one has found a method of communication that she is capable of. She has been seen by the best medical teams Boston has to offer. SHE HAS NO FORM OF COMMUNICATION AT ALL. You may be concerned that she does not have a communication system, how do you think she feels not having one yet being tested 45 times? I had not seen the attached statement, It only serves to show that the Commissioner is not aware of my daughter’s situation. Please answer my question as to how you feel she will not need to do anything she does not normally do. How should your requirements of 45 data points be collected during her normal school day? Simply clueless on the population SHE is responsible for testing. “We recognize that not every student is capable of taking a pencil and paper test, particularly one as demanding as the Massachusetts Comprehensive Assessment System. It is precisely for that reason that Massachusetts developed the MCAS-Alt, an alternative form of assessment for the state’s most severely disabled students. It is important to understand that the MCAS-Alt is not a traditional test. It is a way of assessing a student’s mastery of the state curriculum standards by reviewing a portfolio of the student’s classroom work. I am hoping that was just a quick response to the news program. He is out of town and has a registered letter from me waiting for him. I won’t post it here until after he receives it. I actually wrote to the “MCAS-Alt Coordinator” at the MA DOE with the question in the previous post. I asked her why she told me that my daughter would not even know she was being tested (the quote was hers). I asked how she can be tested on 45 data points from the Curriculum Frameworks and then asked to self-evaluate and she would not know a test is going on. I openly cc’d the email to the press, the school district, and others that work with her because the mistruth was specifically told to all of them. Surprise, surprise, no response. I know she got the email because I attached a return receipt to it and it came back within twenty minutes. Well, it has been just about a week and no response. So, what’s a dad to do? I really want to know why she has said these things that ultimately make me look like I am crazy if they were true. I re-emailed it to her today. And I openly cc’d the Commissioner of Education. Maybe she’ll answer. Why does the Massachussetts Department of Education tell untruths about the MCAS-Alt exam? I want to assure you that participation in the alternate testing will not require your daughter to do anything she does not do every day at school. HOWEVER, given the information you have given me, I do not see why your daughter should ever need to be involved in “testing,” in the traditional sense. In other words, she does not have to answer special questions in a testing situation. She has no need to know the NCLB exists. And even saying this to the ABC news anchor here. Let us once again visit the facts as to what the MCAS-Alt is. Even better, let’s use THEIR facts. Their requirements. That Framework is the same one that ALL students are tested against, disabled and typical. ALL THE SAME. First, the disabled student is REQUIRED to “produce” as independently as possible, “using his or her primary mode of communication” an introduction to the portfolio. This is not optional. (page 33) Obviously, having no communication shows this exam is wrong for her, yet she must be asked to do something specifically for the test. She must be told she is being tested. Second, and much more to the point, the teacher MUST produce for the student at least 45 “data points” on nine “data charts.” These must cover three subjects (and at the level specified in the Massachusetts Curriculum Framework for her grade), Math, English and Science. Within each subject, there must be three data charts for different sub topics. The data points MUST be repeated at least 5 times over a period of 5 to 45 days. Be aware that data points “measure the student’s accuracy and independence in performing tasks related to a skill or outcome in the strand being assessed.” (page 34). Furthermore, and even more disturbingly, “Note: Data charts must show that the student has attempted to learn a new skill …” (emphasis THEIRS, page 34). A data chart will not be vaild if it does not “show evidence that the student has learned a new skill … a data chart will not be considered scorable primary evidence if it indicates that a student performed at a level of 80-100% accuracy and 80-100% independence throughout the data collection period.” (page 38, emphasis theirs) This is not simply placing the student’s work in a folder. She MUST be tested and MUST show attempts at Math, English and Science and assessed against the Framework. Forty-five times, minimum. Something she NEVER does outside of the MCAS. Additionally, self evaluation is important throughout and mandated at times. How do you show self evaluation by my daughter of the test she is given and yet not tell her she is being tested? So, at least 45 times the teacher must test my daughter in Math, English or Science, something never taught, never tested otherwise. This is separate from work samples, anything she may produce during routine instruction that may be included in the portfolio. Why do they “mislead” about this? Data Charts must be included in the portfolio that “measure[s] the student’s accuracy and independence in performing tasks on at least five different dates …” “Data charts must show that the student attempted to learn a new skill.” Multiple data charts are required. The exams given to my daughter will be protracted occurring over many days and weeks to fulfill the required data chart requirements. This is not required of the vast majority of students, nor is the need for repeated testing. Additionally, it is required to “show that the student attempted to learn a new skill.” Thus, in order to complete the exam, she “must” show she is attempting to learn a new skill, a requirement not needed by other students and a requirement that is physically impossible for her to fulfill. With no communication skills, showing an attempt is an unattainable goal. The test portfolio is completely inappropriate and not designed for someone such as my daughter. What EXACTLY the MCAS claims to test vs. my daughter. The test AS DESIGNED cannot assess what it claims to in regards to my daughter. As required by the Education Reform Law, students must pass the grade 10 tests in English Language Arts (ELA) and Mathematics as one condition of eligibility for a high school diploma (in addition to fulfilling local requirements). 10.N.1 Identify and use the properties of operations on real numbers, including the associative, commutative, and distributive properties; the existence of the identity and inverse elements for addition and multiplication; the existence of nth roots of positive real numbers for any positive integer n; and the inverse relationship between taking the nth root of and the nth power of a positive real number. 10.N.2 Simplify numerical expressions, including those involving positive integer exponents or the absolute value, e.g., 3(24 – 1) = 45, 4|3 – 5| + 6 = 14; apply such simplifications in the solution of problems. MCAS is designed to measure a student’s knowledge of key concepts and skills outlined in the Massachusetts Curriculum Frameworks. A small number of students with the most significant disabilities who are unable to take the standard MCAS tests even with accommodations participate in the MCAS Alternate Assessment (MCAS-Alt). MCAS-Alt consists of a portfolio of specific materials collected annually by the teacher and student. 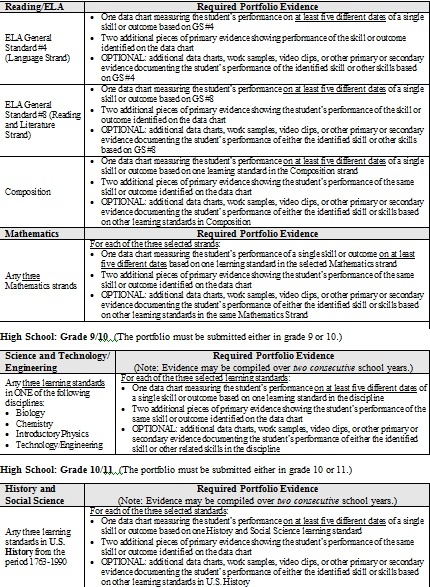 Evidence for the portfolio may include work samples, instructional data, videotapes, and other supporting information. So the Commonwealth decided to have a separate (but equal?) curriculum framework for students with disabilities. This time, instead of looking at age appropriate for my 15 year old, nineth grade daughter, let’s look at the PreK and Kindergarten requirements. Count by ones to at least 20. Match quantities up to at least 10 with numerals and words. Identify positions of objects in sequences (e.g., first, second) up to fifth. Compare sets of up to at least 10 concrete objects using appropriate language (e.g., none, more than, fewer than, same number of, one more than) and order numbers. Understand the concepts of whole and half. Identify U.S. coins by name. Use objects and drawings to model and solve related addition and subtraction problems to ten. Estimate the number of objects in a group and verify results. My daughter not only cannot do any of those things and they are Pre K standards. Most importantly, THE SCHOOL HAS NEVER ATTEMPTED TO TEACH HER THOSE THINGS. Read that again. Now, why should she take a test that assesses that which was NEVER TAUGHT. If they need to assess what the school is doing for her, what she is learning, she should be tested on that which has been taught or minimally attempted to be taught. MY DAUGHTER CANNOT DO ANY OF THOSE SKILLS. MY DAUGHTER HAS NEVER BEEN TAUGHT ANY OF THOSE SKILLS. THERE HAS BEEN NO SERIOUS ATTEMPT TO TEACH MY DAUGHTER THOSE SKILLS. THOSE ARE NOT MATH SKILLS WHY ARE THEY USED TO ASSESS MATH KNOWLEDGE? This test cannot assess my daughter in any of those actions or skills. Period. I had an hour conversation with Nancy from Washington (previous post). Her son is also very disabled, although not as severely as my children. It appears that the services given to her son are very inferior to those afforded to my daughter. She fought the exam by claiming that it simply was not designed to assess her son. How do you assess reading when in fact you never even tried to teach him to read? How do you assess math when you never even tried to teach him math? Also, the basis for testing assumed, in writing, a basic comprehension. So her argument, was simply that you should assess and hold the school accountable, but the test you are giving does not do that. A Spanaway mother has won an exemption from the state testing system for her son who is deaf-blind. Though state law requires that schools test all students using either the Washington Assessment of Student Learning (WASL) or the Washington Alternative Assessment System (WAAS), Nancy Vernon believes this requirement violates her son’s rights under the Individuals with Disabilities Education Act (IDEA) and will cause him to be denied an education appropriate to his special needs. Read the entire press release here.